A Banksy artwork which had been withdrawn from an auction in the US has been put up for sale again. The mural, called Slave Labour, disappeared from a wall in Wood Green, north London, in February and appeared in a Miami sale. But it was removed from the lot after protests by Haringey Council. It is now up for auction in June in Covent Garden by the Sincura Group. A local councillor and the local Trades Union Congress have attacked the sale. 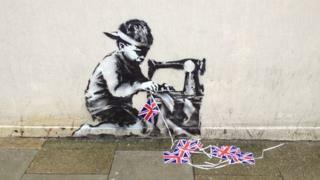 The mural, which depicts a boy hunched over a sewing machine making Union Jack bunting, appeared on the side of a Poundland store last May, just before the Diamond Jubilee celebrations. A spokesman for the auctioneers Sincura said the mural "has been sensitively restored under a cloak of secrecy", and will go on show alongside pieces by Damien Hirst, Andy Warhol, Mario Testino and Russell Young. But Wood Green councillor Alan Strickland said: "This is a piece of art given to the community for public enjoyment, and people will find it galling that you can only view this work at an expensive champagne reception, when it belongs with the people of north London, not a private owner. "We saw the level of public anger last time, as the story went around the world, and I expect the same this time." And Keith Flett, secretary of the Haringey Trades Union Congress, said: "The Slave Labour Banksy belongs to the people of Haringey not to a wealthy private client." When the mural was up for auction in Miami, it was expected to fetch up to £450,000. There was suspicion it had been stolen when it disappeared but the Metropolitan Police said there were "no reports of any theft". Slave Labour will go on sale at the London Film Museum on 2 June.